The VSP-5000 is an ideal solution for streamlining the myriad configuration and management tasks associated with the deployment, operation, and maintenance of Voice and Video over broadband CPE devices. The VSP-5000 can allocate and manage CPE IP addresses; distribute initialization and firmware update files to authenticated CPE devices; and log all provisioning related messages and events for every registered device. This flexible and highly-available system has been designed from the ground up to meet the evolving challenges associated with managing broadband telephony equipment. 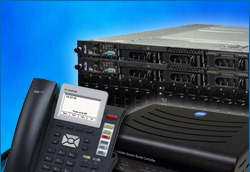 The VSP-5000 solves many problems associated with the management of Voice and Video over IP service deployments. New CPE devices can be installed and brought into service with zero configuration, either at the point-of-sale, the distribution center, or at the subscriber’s premises. Devices deployed behind NAT firewall routers are managed effortlessly, with no firewall reconfiguration. New features can be enabled via automatic software upgrades. Device configuration issues may be diagnosed with the help of extensive, real-time log information and the VSP-5000 integrates seamlessly with other network management equipment. 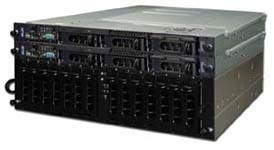 The VSP-5000 is built on a pair of dual, redundant servers with shared RAID storage. Thus, in the event of a hardware failure, the provisioning services are migrated seamlessly to the backup node with a minimum of downtime, typically less than a minute. The VSP-5000 can be seamlessly integrated with other network management equipment via its OSS interface. The HTTP interface allows for device and class information to be added, updated or deleted from the database by authorized management computers. Customized batch importing of client records from proprietary databases is supported; InnoMedia will furnish sample applications to qualifying OEM vendors demonstrating the use of the OSS interface for this purpose. • As an additional convenience, the VSP-5000 can support legacy devices that rely on simple TFTP provisioning schemes.